Today I fell in love with Manish Arora. Held at Garage Turenne, this show was exciting from the moment I stepped inside the venue. 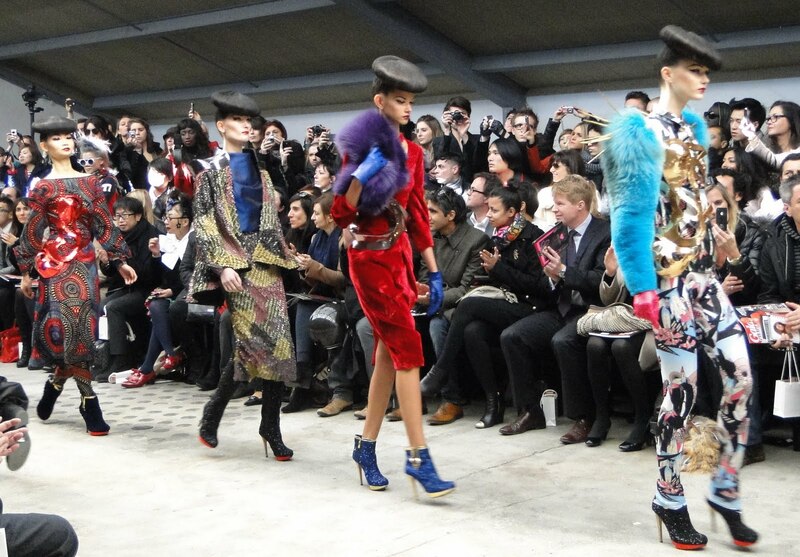 Vibrant colors adorned just about every person that came to see this famous designers collection. Looking around the crowd, the excitement of the show was obvious. The staple black outfit that is usually the uniform at fashion shows was traded in for bright, energetic colored attire. 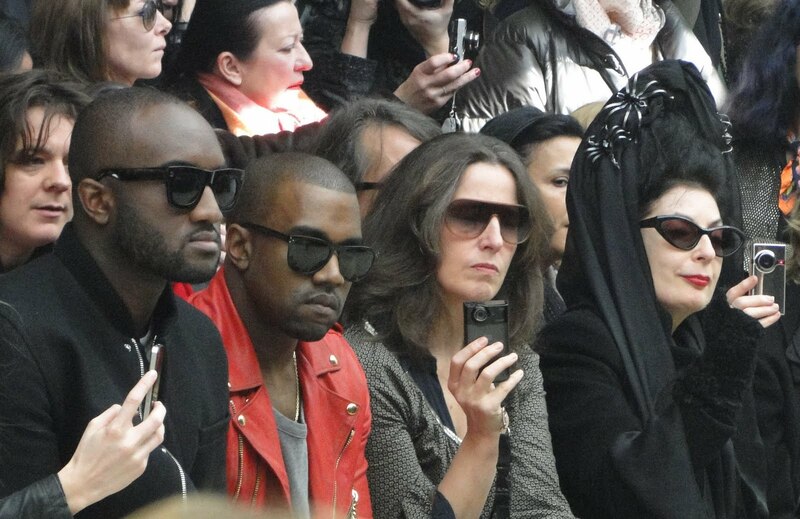 When looking through the crowd, I noticed Kayne West sitting opposite me, also in a brightly colored leather jacket. Sitting beside him was the famous fashion icon, Diane Pernet of “A Shaded View on Fashion” website! I was so excited to be at the same show as them! The show began with Magician Benjamin Dukhan wheeling an empty metal cage into the middle of the catwalk, covering it with a cape and, with a tap of a flaming torch, a model appeared inside. As the models made their way down the runway, I was in awe of the amount of Swarovski crystals that adorned the pieces. 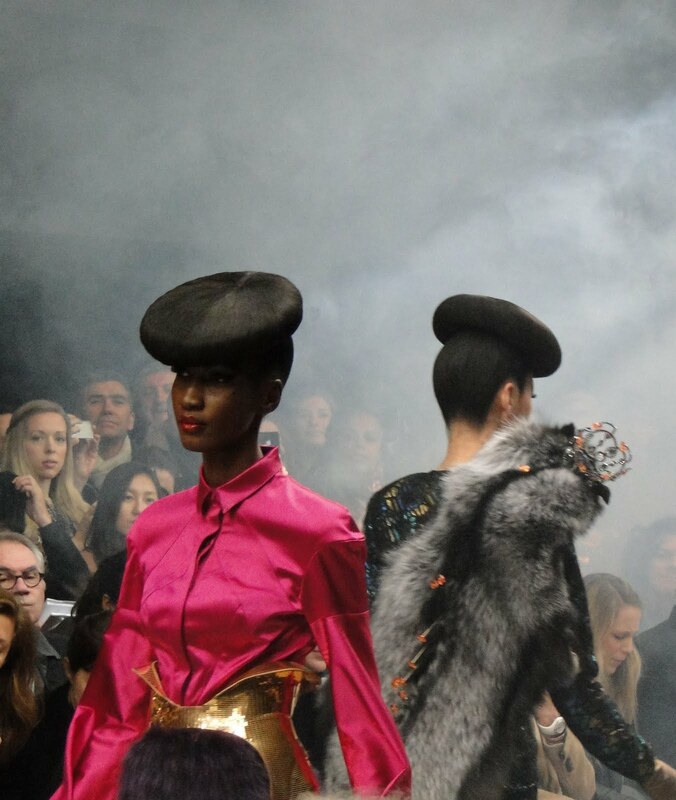 Each outfit had an impressive amount of Swarovski crystals, rich embroidery and mirrorwork. 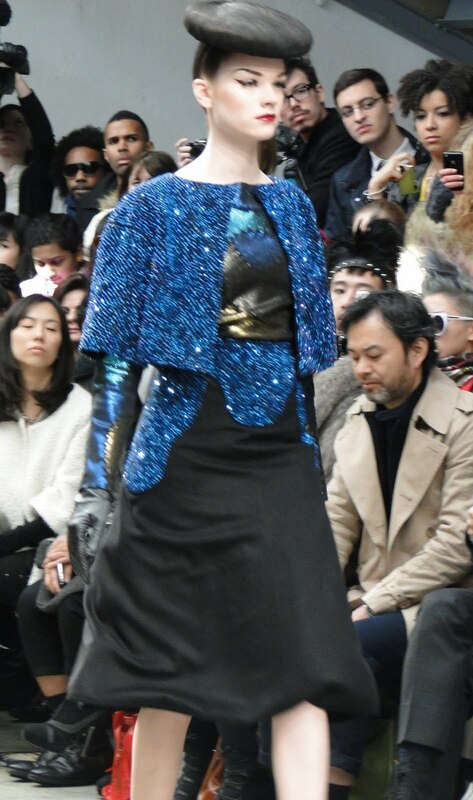 Embellishment combinations of lamé fabrics and crazy patchwork prints paired with crystal body armor created an almost magical presence in the clothes themselves. This stunning floor-length ballgown looked as if it was made out of stiff colored paper and cut like a paper snowflake. 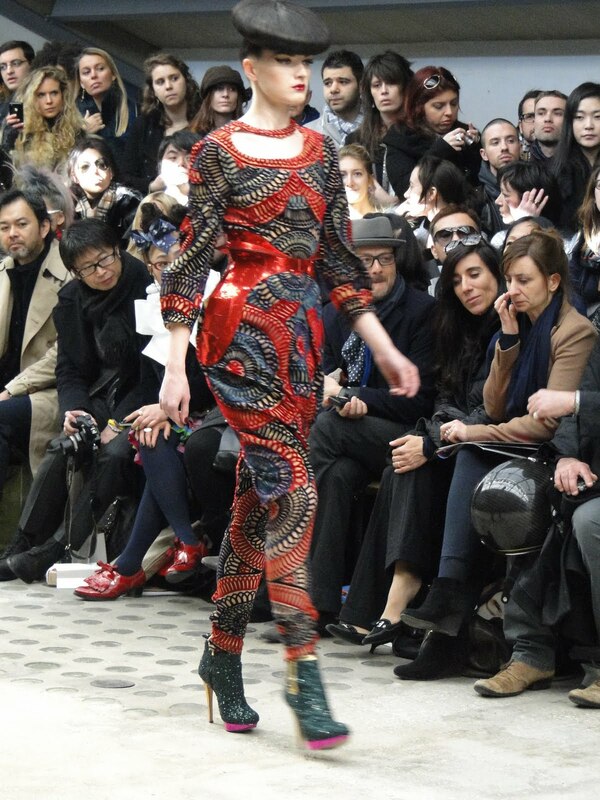 The same pattern was then seen coming down the runway, printed on a full body catsuit. I was also just dying over the shoes and boots that were covered in Swarovski crystals that were just about the most sparkle I have ever seen! The collection from Arora was overall magical with undertones of stylized interpretations to Indian and Asian cultures. 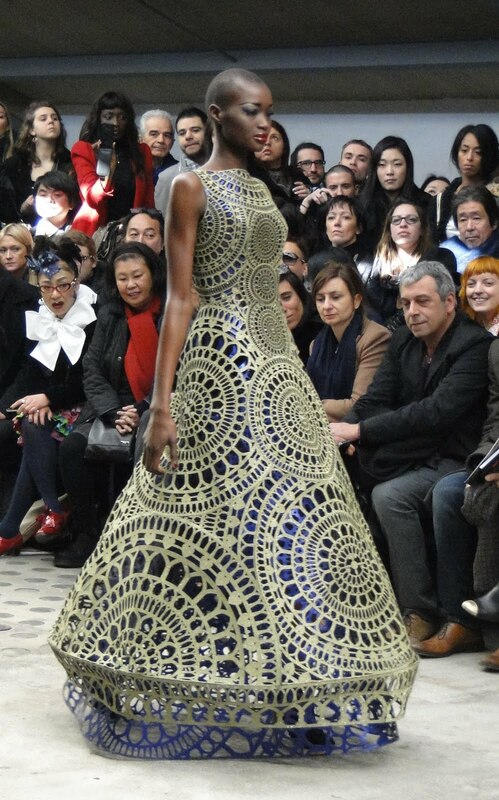 Manish Arora was recently appointed artistic director at Paco Rabanne. Fashion industry leaders are anxious to see what the over-the-top designer has in store for this iconic brand.